SUNCOAST® Bedding by Agri-Products, Inc.
SUNCOAST® Pine Shavings Bedding offers premium quality, pure pine shavings horse bedding for excellent cushioning and maximum absorbency. SUNCOAST® PINE SHAVINGS LARGE FLAKE available in both 12 & 10 CUBIC FOOT- Great Fluffy Bedding for Horses and other animals! Premium Quality Pure Pine LARGE size flakes for maximum cushioning and great absorbency. Fresh natural pine scent. ULTRA compressed bale Expands to a full 10 & 12 Cubic Feet! SUNCOAST® PINE SHAVINGS MINI FLAKE 8 CUBIC FOOT- Pine shavings for bedding horses and other animals. MINI FLAKE SIZE- EASIER TO SIFT & PICK - reducing stall maintenance time and waste. ULTRA compressed bale expands to 8 Cubic Feet! SUNCOAST® CEDAR SHAVINGS 6 CUBIC FOOT- Premium pure cedar shavings ideal for some small animals and to add to pine shavings for extra freshness. Natural cedar scent helps repel many insects. What Sets SUNCOAST® Apart From Other Horse Shavings? EXCELLENCE IN ANIMAL CARE™! SUNCOAST® was first to manufacture pure pine shavings for animal bedding in state-of-the-art ULTRA compressed bales, becoming the benchmark for the industry. This positively changed consumers expectations for BEST POSSIBLE CHOICE in animal bedding, and improved the habitats for countless animals. SUNCOAST® Pine Shavings ULTRA compressed bales provide MORE quality shavings in convenient lightweight bales. The high-heat dried & ULTRA absorbent shavings provide a softer cushion to promote leg health and better rest time in the stalls. SUNCOAST® Pine Shavings is a low dust bedding product. Dust can cause inflammation of the nasal passages, throat, irritate the lungs, tear ducts and be potentially detrimental to animal and caregiver respiratory health. SUNCOAST® screens the shavings multpile times throughout the manufacturing process to ensure the lowest possible dust content. How Do I Know Which Shavings Size (Large Flake, Mini Flake) Is Right For Me? SUNCOAST provides a choice of large, mini, and fine size shavings. Some customers prefer a smaller flake for quicker cleaning. Some prefer a larger flake for maximum loft, and cushion. Other customers use the mini flake as a base and top it with the large flake. All SUNCOAST product are manufactured in the same process, ensuring dry, absorbent, quality pure pine shavings in every bale. What Do Customers Say About SUNCOAST® Pine Shavings? "I had a very sick bedridden mare for over a year. ONLY Suncoast could stand up to the constant pressure of a large horse laying down on them, hour after hour- day after day. I got the large flakes. They were dust free and my mare would get so excited when I put them in every week. I piled them in the center and she would lay right down on the middle of them ...sighing... and totally relaxing. Everything else I tried just turned to powder in 2-3 days. I traveled an hour every month to a dealer and it was the best money I ever spent. Super reasonable, super clean, and they held up to the job!" "SUNCOAST® has always been my first choice to keep my horses healthy and comfortable on the road and at home. They have the best bedding product on the market today." We use SUNCOAST® Bedding Large flakes. They're great shavings for our pigs. We like the low dust and longevity of the large flake. 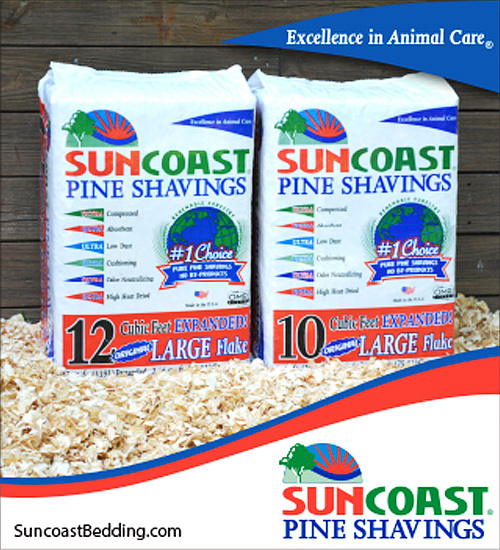 Order Your SUNCOAST® Pine Shavings Today! SUNCOAST Bedding Dealers can be found throughout the country! To learn more about our products, and for more information about purchasing and to find a dealer near you, please call us or visit our website today!